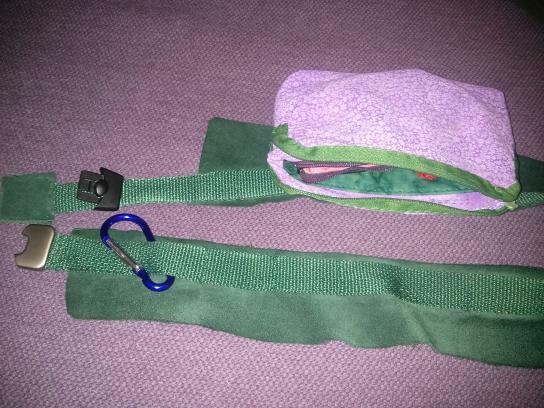 I’ve talked about pouches, now I’m going to talk about what they attach to – the belt and the purse rig. The belt is actually quite easy to sew, if rather tedious. I just attach the buckle at one end, then sew a vertical line attaching the nylon strap to the leather every 4cm, all the way around (plus a bit extra where I had to use a second piece of leather). The nylon strap should be as long as your belts, plus a bit for attaching the buckle; the leather should be a bit less than the narrowest you’d ever have the belt. The height of the leather piece is important too – you need a bit of a lip at the top, maybe 0.5-1cm, to protect against any scratchy bits on the pouches, and enough below that the belt grips your clothes and stays in place. Mine’s about 2 inches thick. As for the buckle… The rough belt had d-rings, which are great for small adjustments but take a bit longer to get on and off. For the good belt, I picked a buckle with quick-release that also looked like one side could be adjustable. The quick release was great, but in practice the adjustable part was too loose. After the belt fell off a couple of times, I added a scrap of leather to the end so that it couldn’t slide out all the way. Now at worst, it ends up on my hips. Next time I might put in a separate adjustable bit, though. 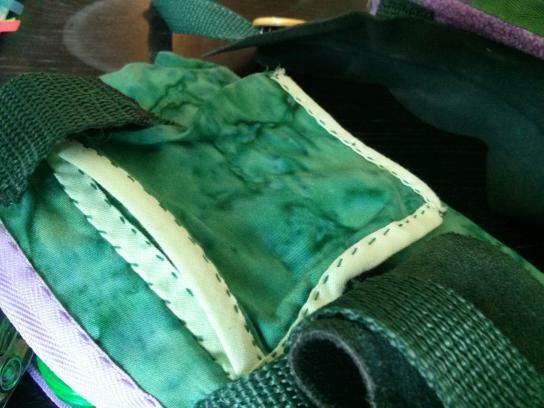 Today, I’m going to go into detail about my current set of pouches. Both are based on the same pattern. Both have the same molle straps on the back. Where they differ is that the wallet pouch has a slot on the back for a bus ticket, whereas the phone pouch has a divider and some boning to keep the phone protected and easy to reach. The seams were a bit fiddly too – I had them sewn twice, so that the ends turned in on themselves and couldn’t fray [edit: TIL this is called a french seam], but because the two margins were the same size, little frayed bits stick out of the outer seam in a few places. I had more success on the second round, but it still wasn’t perfect. I did learn a couple of things here: first, the straps need to be just a tiny bit further apart to fit a bus ticket between them. Second, the sew-on snaps I’ve been using are not ideal – they always feel like the thread could snap at any moment, and the thread seems to stretch after a while too, leaving them a bit loose. I bought a selection of alternatives from dressew and tried them out; in the end, the strongest seemed to be the press-on snaps and some little white buckles. I’ll be trying those out next time I build a new pouch. Now, the ticket holder… At first I tried sewing on a scrap of netting. That did at least prove I can get a ticket in there if it pushes the straps aside a bit, but it turned out to be a terrible material – bus tickets kept catching on it, and eventually it tore (and I never did get a photo of it! darn). 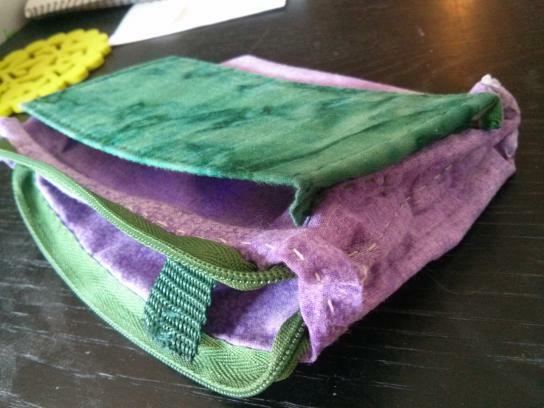 The second time, I used the same fabric as the pouch, and made a two-sided little envelope, with boning at the opening, before sewing it to the pouch. 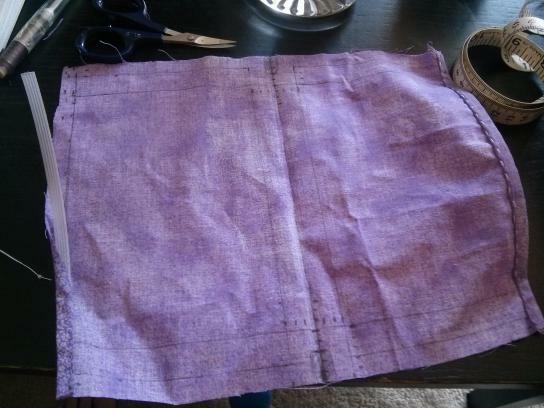 For the seams, I decided to try a different method – I sewed only once, with bias tape covering the rough edges. Maybe I’m doing it wrong, but it was super fiddly to sew, probably took longer than sewing twice, and I didn’t have a good way to finish the ends of the bias tape itself. To attach it to the pouch, I sewed the top edge on first, but it was getting folded up sometimes, so I added a line of stitching down the middle (not visible in the photo) to form a T-shape. 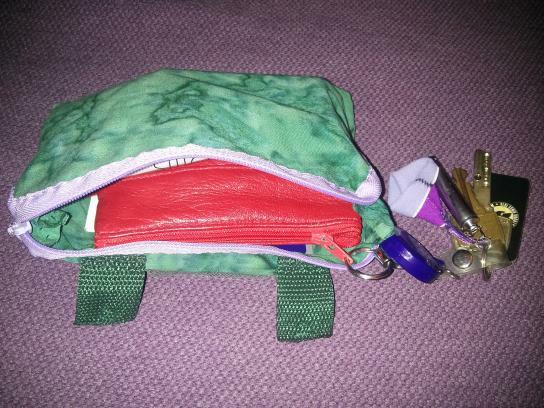 Oh, and one last lesson – things inside the wallet pouch can obstruct the ticket holder. >.< I’ll have to add a stiff panel between them next time. The other addition was the boning in the opening. It helps hold the structure a little, but it makes the zipper even harder to close. And usually flips itself over too. I might try a shorter piece next time. I’ll also try adding it to the wallet pouch – it could do with a little more structure so that there’s space beside the wallet itself. 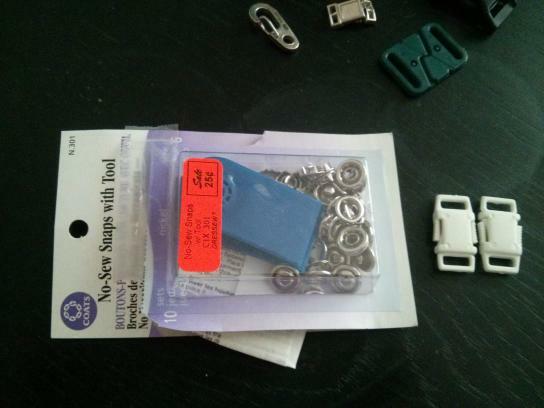 I’ve done a lot of sewing since my previous “pocket hacking” post. For one thing, I’m actually at a point where I can wear my creations out in public. :) At the end of the last post, I was hoping I’d summarize some of the problems and solutions this time. But, that’s no fun. I’m just going to discuss what I made again. First off, I did finish that laundry pouch from last time, and it was useful. 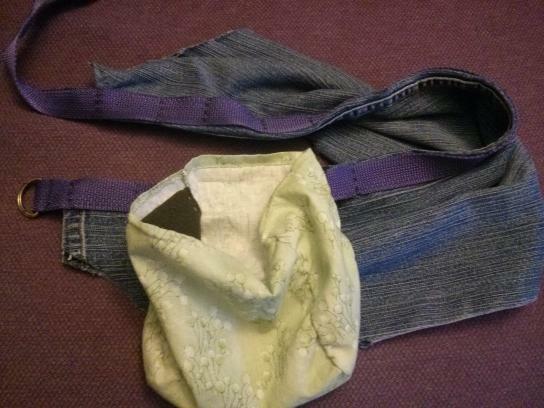 :) I also made a simple molle belt out of the first thing that was handy (an old jeans leg). For a while that was all I had, as I planned and procrastinated on the next set of pouches, and continued the quest to not have goddamn headaches all the time (which is actually making progress now, yay, but debugging humans is sloooowwww). Eventually, though, I decided to bite the bullet and just make a wallet pouch, even though I still wasn’t sure what I wanted. 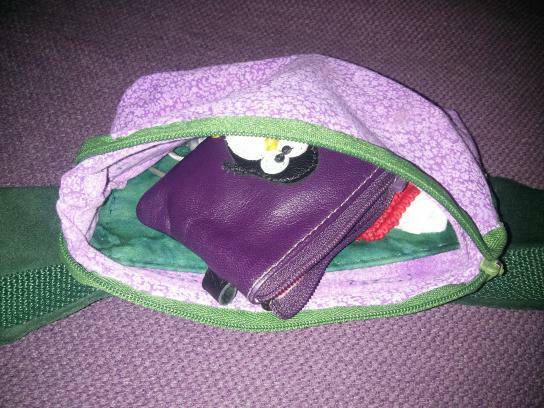 I went for a very simple design – heck, I could have used a pencil case, if I had one in the right size and colour – added molle straps, and that was it. It fit the wallet that I was using in my purse, so I didn’t have to move individual cards and such when switching between them. Later I tried to add a bus ticket holder on the back, but it didn’t really work out. 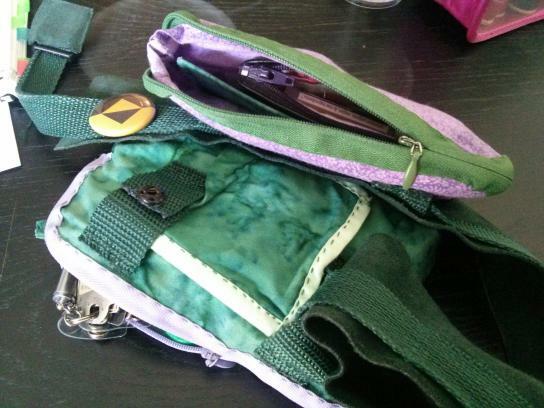 Once I had those pouches, I could put my entire purse contents onto my belt. But my outfit didn’t always include a suitable belt, and sometimes a purse is the easiest option, so I made a quick frame to combine the pouches into a purse. 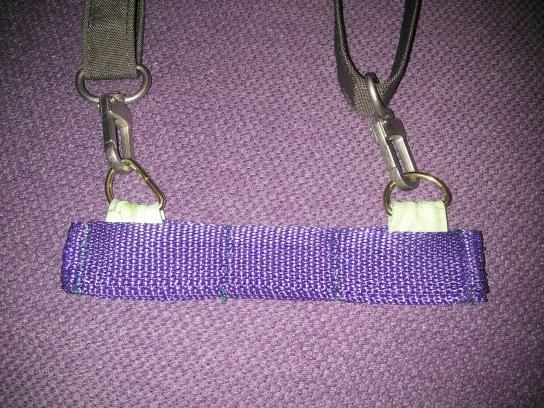 It’s just three nylon straps sewn together, with rings to attach a purse strap (the strap is borrowed from another purse, at least for now). So that’s what I’ve been wearing this summer. :) It works fairly well, and a friend even asked about me making one for her. :) It’s a good thing that it’s summer, though – absolutely none of this is waterproof. I have started on plans for waterproof covers, but for the moment I’ll have to hide the belt under a jacket if it rains. I’ve glossed over a lot in this post – I could probably talk for an hour about each photo. Maybe I’ll write another post with details, maybe I won’t.